(Nanowerk Spotlight) The fight against infections is as old as civilization. Silver, for instance, had already been recognized in ancient Greece and Rome for its infection-fighting properties and it has a long and intriguing history as an antibiotic in human health care. Modern day pharmaceutical companies developed powerful antibiotics – which also happen to be much more profitable than just plain old silver – an apparent high-tech solution to get nasty microbes such as harmful bacteria under control. However, thanks to emerging nanotechnology applications, silver is making a comeback in the form of antimicrobial nanoparticle coatings. As even the most powerful antibiotics become less and less effective, researchers have begun to re-evaluate old antimicrobial substances such as silver and as a result, antimicrobial nano-silver applications have become a very popular early commercial nanotechnology product. Researchers in China have now further advanced the nanotechnology application of silver by developing a novel multi-action nanofiber membrane containing four active components, each playing a different role in the membrane's excellent antibacterial function. While the preparation of multicomponent materials is not new, their fabrication usually is based on the co-precipitation method where the resulting materials are generally obtained in powder form – which makes their practical application difficult because it requires further steps to prepare coatings or thin films. The novelty of the Chinese team's approach is the development of a facile and effective approach to produce membrane or film materials with comparable or even higher antibacterial activity. "Using an electrospinning technique, we have prepared a new kind of free-standing antibacterial membranes, which contain silver, silver bromide, titanium dioxide, and hydroxyapatite as four active components," Gunagtao Li tells Nanowerk. "In this antibacterial membrane, each component serves a different function: apatite as the adsorption material for capturing bacteria, silver nanoparticles as the release-active antibacterial agent, silver bromide nanoparticles as the visible sensitive and release-active antibacterial agent, and titanium dioxide as the UV sensitive antibacterial material and substrate for other functional components." Using standard antibacterial evaluation tests, Li, a professor at the Key Lab of Organic Optoelectronic and Molecular Engineering at Tsinghua University in Beijing, China, together with his collaborators, clearly showed that their nanofibrous membranes possess excellent antimicrobial activity under UV light, visible light or even in a dark environment. Li points out that, compared to the four component system in powder form reported previously, the fabricated materials show double the antibacterial inactivation of E.coli under the same evaluation conditions, indicating that the addition of the electrospun membrane could significantly improve antibacterial efficiency. Additionally, the used technique has the potential to be scaled up to the industrial scale. The Chinese team describe their findings in the May 26, 2009 online edition of Nanotechnology ("Multiaction antibacterial nanofibrous membranes fabricated by electrospinning: an excellent system for antibacterial applications"). 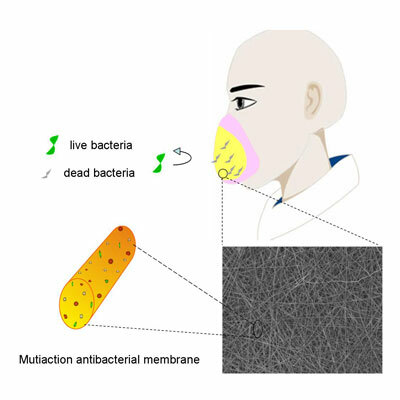 Besides their superior antibacterial activity, the free-standing morphology of the prepared muticomponent membranes could be beneficial for numerous practical applications. "Our experiments clearly demonstrate that the combination of the excellent antibacterial properties arising from the four components and the unique structure features of electrospun membranes is a promising approach for fabricating more efficient antibacterial materials," says Li. " It holds great promise for numerous potential applications in the areas of respirators, air conditioning filters and antibacterial coating." Electrospinning is a facile approach for the fabrication of continuous fibers with diameters from the micrometer to nanometer scale. "However" as Li explains, "the successful preparation of desirable nanofibers with well-defined morphology is strongly dependent on numerous factors such as solution viscosity, the used solvent, solution conductivity, surface tension and the applied electric field intensity etc. Hence, how the electrospinnable solution is prepared is a critical point, especially for the case of multicomponent systems." In their case, the Chinese team found that producing fibers by simply mixing the four components or precursors in different solvent systems failed. Experimenting with various processes, the scientists found an approach that works by fabricating silver and silver bromide nanoparticles in advance and then dispersing them in titanium dioxide and apatite precursor as feeding solutions. Li says that the goal of his group's work is the facile fabrication of antibacterial materials with efficient and sustainable antibacterial activity as well as a broad-spectrum of antibacterial capability. "Therefore, further improving the antibacterial activity of the prepared multicomponent membranes is the most important aspect that we will focus on in the future. By using hierarchically structured porous materials as well as more appropriate components, we hope that we can achieve more high-performance antibacterial materials and, ultimately, develop them into commercial products." Although important progress has been made in developing efficient antibacterial materials, the easy synthesis of materials that simultaneously possess high antibacterial activity, a broad-spectrum of antibacterial properties, fast recovery capability, and sustained delivery of antimicrobial agents still is a major challenge.